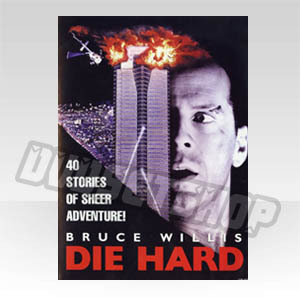 On Christmas Eve, Detective John McClane (Bruce Willis) of the New York City Police Department arrives in Los Angeles to reconcile with his estranged wife, Holly Gennaro (Bonnie Bedelia). 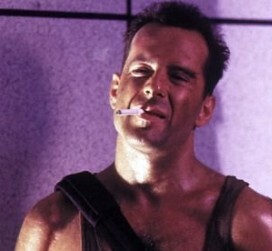 McClane is driven to the Nakatomi Plaza building by a limo driver named Argyle (De'voreaux White). 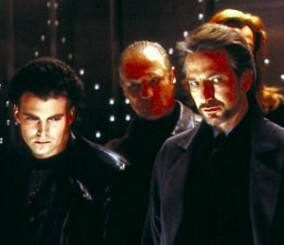 The company Christmas party is disrupted by the arrival of thirteen terrorists led by Hans Gruber (Alan Rickman). The terrorists cut the telephone lines, seal the building exits, trapping Argyle and the limo inside the parking garage and replace the building guard with one of their own. 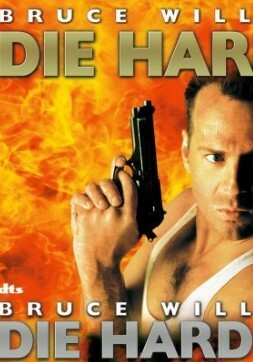 Hans and his group secure the party goers as hostages, but McClane manages to slip into the stairwell of the building. Gruber portrays himself to the police as a terrorist working towards various extremist goals, but it is revealed that they are actually trying to steal $640 million in bearer bonds from the Nakatomi vault. When Nakatomi executive Joseph Takagi (James Shigeta) refuses to reveal the code for one of the vault's seven locks, Gruber executes him. Gruber orders Theo (Clarence Gilyard Jr.), his technical expert, to break through the locks on the vault. Theo reminds Hans that the final lock is powered by circuits that cannot be cut locally. Gruber promises to handle the last lock.